Saurabh Lahoti is General Partner and Investment Lead of Alacrity India. He has over 14 years of experience in industries including technology, M&A and venture capital. He started his career with Infosys Technologies where he worked in San Francisco with their Banking and Capital Markets division clients. After his MBA, he worked with Ashland Inc. (a fortune 500 company) and was part of their M&A and growth office and helped the Ashland performance materials division to expand in India through acquisitions and JVs. Post that, he has been primarily involved in Indian entrepreneurial ecosystem and has been associated with small to mid-sized investment funds and accelerators in India including Ennovent Impact Investment Holding, Grassroots Business Fund and Rajasthan Venture Capital Fund. During this time he invested in and managed relationships with more than 20 companies, representing more than $20Mn in investment, in sectors including technology, mobile, manufacturing, energy, healthcare and agriculture. He secured exits for four companies. 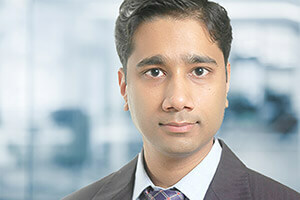 Saurabh holds an MBA in Finance and Investment Management from The Ohio State University and a B.Tech. from The Banaras Hindu University (now IIT (BHU)-Varanasi).